This delightful, typical stone built Welsh cottage sits in 5 acres between the hills and the sea. 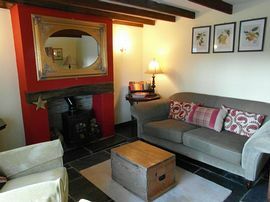 Overlooking the gorgeous Preseli Mountains National Park, just 10 minutes from the coast.This 2 bedroom cottage is filled with period charm and modern comforts, & sleeps 1 - 4 people plus baby/toddlers. 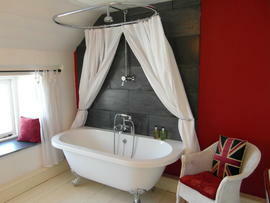 Stay self-catering in our recently renovated cottage, for a great value romantic break or family holiday. We are eco, child and dog friendly. Old Swan Inn is just 10 minutes drive to the coast. It’s also a wonderful place to relax; just lazing in the gardens in summer, stargazing, sunset watching or just snuggling up in front of the log burner in the colder months. 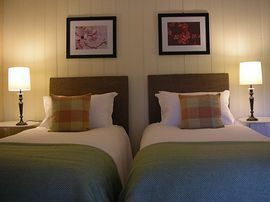 The bedrooms, sitting & dining rooms all have views of the National Park. There is free wi-fi, Flatscreen TVs, a large private garden, and plenty of off-road parking. There is a superking or twin room, and a king room with deep comfy window seats, a lovely large bathroom with rolltop bath. Dining room, sitting room with log burner, dining room and bespoke fitted kitchen. This traditional period cottage sits in five acres, nestled on the edge of the beautiful Preseli Mountains Coastal National Park. Its location near the borders of the three counties of Dyfed, makes it an ideal centre for touring, walking, cycling, mountain biking, motorcycling, watersports, golfing, fishing & exploring the beautiful coast and countryside of West Wales. We aim to be green wherever possible and have used natural, organic, & low allergy building materials in the cottage & grounds. We have recycling and composting facilities and, to offset your visit, we will plant a tree in our woods or orchard for every booking - or you can plant your own! Between the mountians & the sea. Panaramic views of the Preseli Mountains National Park. See Access Statement link on our own website, for full details, to see if the cottage meets your particular requirements. 2 small to medium well behaved dogs. £10 per dog per week. Large enclosed garden, new orchard with firepit, meadow walk. Five acres in total. Local Services: Shop and petrol garage, 1.5 miles. 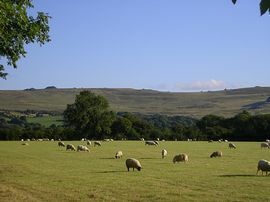 Nearest large village with shops, butcher, pub, cafe, chemist etc..5 minutes drive away. Take the M4 west, follow the A48 to Carmarthen and the A40 to St Clears. Keep on the A40, signposted Fishguard, and at the Narberth roundabout, turn right onto the A478 for Cardigan. Head north until you reach Crymych. Turn left at the Crymych Arms Pub, follow the windy road for a mile then turn left at the cream house with a postbox. Keep on this road for a mile until you come to two houses on the left before a sharp left hand bend. Take this left and after ¾ of a mile you will find Old Swan Inn hidden by the trees on the right. Travelling south from Cardigan, take the A487 Fishguard road. 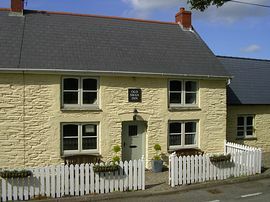 Take the first left in Eglwyswrw, then just out of the village take the first right down a narrow road. After 1 mile you will come to a T-junction. Turn left and you have reached Old Swan Inn. See map. From: £335 To £695 per week.